The plan was to transit through the city on our way to North Sikkim, but plans have a way of changing themselves, and I ended up staying for a week (Read: Looking Back: My Worst Travel Memories). Unexpectedly enough, Gangtok helped me heal, both physically and mentally. If you plan to visit, stay a while, take my travel guide, and let the city work its charm on you too. A Sikkimese meal at Nine Native Cuisine. Nine Native Cuisine, MG Road. Hands down, the best Sikkimese food I tasted in Gangtok, and perhaps all of Sikkim. The set meal is a must try, with local delicacies like gundruk (fermented Spinach soup), fermented soy, cheese, and flavorful curries. The melt-in-your-mouth-momos are to die for. And regional dishes like the Bhutanese Ema Datchi (a curry made with cheese, potatoes and chillies) are delicious. Chat about Sikkim with the friendly owner while you wait for your meal. Baker’s Cafe, MG Road. Most people seem to choose The Coffee Shop over Baker’s Cafe and I can’t grasp why, because the latter far exceeds the ambiance and quality of food. Choose to sit above the rooftops of Gangtok, far from the street, with windows overlooking the Himalayas, and order yourself one of their many herbal teas. The paninis and bakery items are great to munch on, as the calm outside soaks your soul. Cafe Fiction, The Development Area. Easily one of Gangtok’s best kept secrets, Cafe Fiction is run by the “Bookman” of the city, an extension of his book shop in the quiet Development Area, a 10-minute walk from MG Road. There is nothing more refreshing than a dose of their signature coffee or organic tea, a grilled cheese sandwich, and a conversation with the Bookman himself. Try the local Hit Beer, anywhere. Before I arrived in Sikkim, I could have never guessed that the state brews the best Indian beer I might ever sample – Hit Beer. A local I met joked that Danny Denzongpa’s (the famous Sikkimese actor who owns the brewery) only gift to Sikkim was ensuring that every Sikkimese man became a drunk! I’m convinced the women love it too, with its delicate taste and high alcohol content. Buy it in a local liquor shop or at any restaurant. 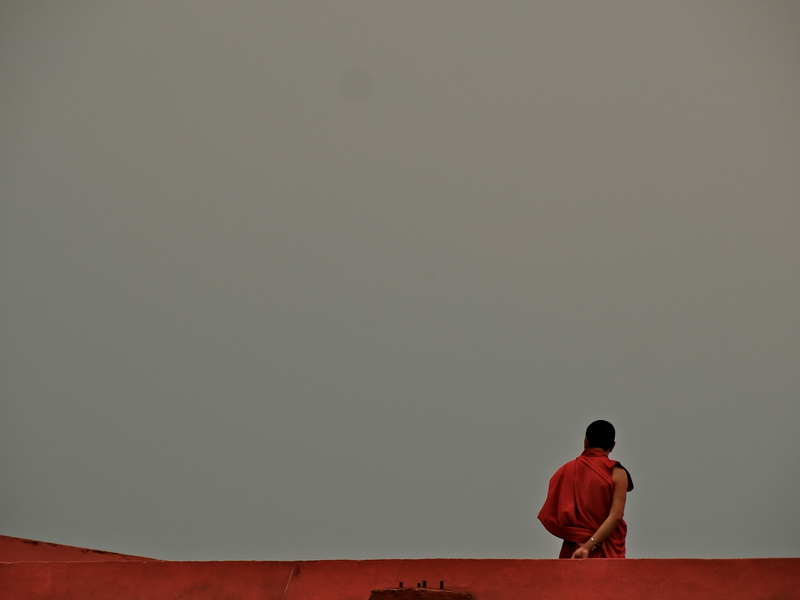 The monks in philosophical debates at Rumtek. Rumtek monastery. There are lots of small monasteries within Gangtok, but none quite as grand or isolated as Rumtek, the biggest in Sikkim. Make your way up, half an hour away from the city by car and another 10 minutes on foot, to meet the monks who live, study and work here. I happened to visit in the late afternoon, and watched in awe as the monks chanted in the courtyard, then broke into pairs for philosophical debates in the Tibetan language. Join the chants. At 4 pm every afternoon, the monks at most Buddhist monasteries gather for chants in the monastery’s temple. Make your way to any local neighborhood of Gangtok, and seat yourself outside the temple (or inside, they don’t mind, but it does feel a little intrusive to me), and let their melodic chants and music move something inside you. Curio Craft Gallery. A short walk from MG Road, on the road that leads to the stadium, stop by a curious little shop of souvenirs and handicrafts called Curio Craft Gallery. They source fascinating pieces of art from regional artists and craftsmen, including hand-embroidered paintings depicting the spirituality in everyday life in the mountains, at very affordable prices. I seldom buy souvenirs, but couldn’t resist one here. Above the rooftops of Gangtok, at Baker’s Cafe. Walking. If I ever decide to lay my bags in a city again, I have one major criteria – it should be walking friendly. That means good weather, little pollution, and plenty to see and discover on foot. Gangtok might be the only Indian city that qualifies. I walked for hours, along quaint neighborhoods, nodding at friendly passersby, now along tree-laden walks, now on skywalks overlooking the frenzy of cars below, mapless and directionless, soaking it all in. Staying at Nettle & Fern, the best hotel in Gangtok. Considering the number of days I spent in Gangtok, I pretty much sampled every decent place to stay. At Tara Palace, they shut the hot water supply (without informing you) at 9 am. Bella Casa overbooked by mistake and tried to kick us out! The blankets at Ming Tok Ling guesthouse gave my friend an allergy. Nettle & Fern was by far, the best place to stay, 10 minutes walk from MG Road, in a quiet neighborhood, with extremely helpful staff, rooms overlooking the valley below, and kind on the pocket. Book early. India Untravelled’s trail from Darjeeling to Sikkim. If like me, you love to get off the beaten track, I’ve helped curate the perfect trail at India Untravelled. You stay on an organic tea farm in a village near Darjeeling, hike from Darjeeling to Sikkim, acquaint yourself with Gangtok while staying at a B&B-cafe-bookshop rolled into one, and pamper yourself at a heritage estate nestled amid the Himalayas of West Sikkim, in the lap of the snow-capped Mount Kanchendzonga. A cafe at the doorstep of your B&B – an India untravelled. The closest airport to Gangtok is at Siliguri (Bagdogra) in West Bengal, a 4-5 hour taxi ride away. Shared taxis are the fabric of life in these remote parts, and I highly recommend you choose them over private cabs for the unique experience of interacting with the locals and being a little more environmentally friendly. What are you most looking forward to on your Gangtok trip? I know what you mean Makrand. Sigh. Beautiful images, makes me wanting to wander again. Thank you for sharing. You really have a great talent in writing and taking pictures. beautiful. Looks like a lovely place. It may be a bit inaccessible though. Which is the closest international airport to the place. It is lovely 🙂 I guess Calcutta will be the closest international airport. Though costs wise, it might make more sense to arrive in Delhi and fly to Bagdogra. I was there a few years ago and it’s one of the cleanest towns I’ve been! Bakers Cafe was certainly a revelation. Great range of teas and amazing food. Thanks 🙂 Go back soon and budget a few hours atleast for Cafe Fiction! You wouldn’t want to leave. I am planning a trip (with my Mom) in early April (11-15, 2015) and I chanced upon Bookman’s BnB and Book Café and instantaneously fell in love with it! I booked. And then I read your blog today and I know I have made the right choice! I love your write ups. Gives me such a fresh perspective, up close and personal, which as a traveler I love! I’ve just been back from Gangtok and Sikkim and it would easily rank near the top cities in the country in terms of quality of life. If what you are looking for is a peaceful, laidback life, it is perfect, however internet connectivity, electricity and transport remain major problems so I’m not sure Gangtok is still a viable option for a city to live and work (unless you work in tourism). The local people are amazingly friendly and most importantly Gangtok is easily one of the best p;aces in India to be a woman. And did I say Sikkimese cops tend to be very helpful and friendly ? Public spaces are remarkably pedestrian-friendly, clean, and most people have a very good civic sense. And the drinking culture is positive, alcohol is everywhere and a part of the culture, so over-drinking and binge-drinking are never problems, people of all ages and genders drink a peg or two every day with lunch. And people have such amazing fashion sense! I have never seen so many men in the streets in tailored dark suits and ties in an Indian city! need some home-stay owners’ genuine number urgently in Sikkim state offbeat areas. My maternal family being from Gangtok, Gangtok had always been my summer vacation spot. This article aptly describes the beauty of Gangtok, it is clean, serene and heart warming place to live in.Well written amazing work Miss Shivya. Previous PostLooking Back: My Worst Travel Memories. Next Post10 Things You Didn’t Know About Me.